in your local convenience store, and you probably know someone who’s making it at home. It’s being touted as the healthy alternative to pop. And it’s the go-to cure for everything from cancer to sunburns. Culturing kombucha is very easy, all you need is a SCOBY (symbiotic colony of bacteria and yeasts). 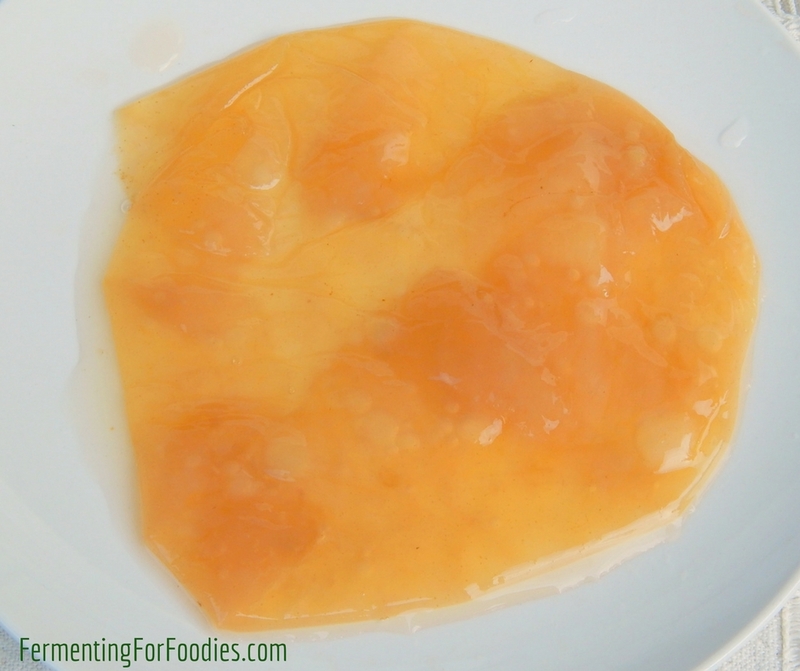 A kombucha SCOBY is thick and rubbery. It grows across the top of a culturing kombucha tea in thin layers that slowly become quite thick. You can divide a SCOBY by cutting it apart. 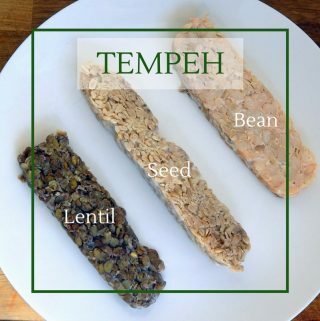 Then you can make a few different batches of kombucha or share with a friend. Just be sure to be clean while handling your SCOBY. Like all ferments a SCOBY does need some TLC. Though SCOBYs prefer a warm room (22C / 72F) they can handle colder temperatures, it will just take longer to brew your kombucha. Like all cultures, you should keep your kombucha in a different location from other cultures (especially kefir, sourdough and other yeast-based ferments). If you’re going away on holiday, or just want to take a break from kombucha then simply stick the scoby in the fridge in some sweet tea. A healthy SCOBY should be fine for a few weeks in the fridge. Boil 2 cups of water and make a sweet tea with the tea bags and sugar (steep until the sugar is dissolved). Add the remaining 2 cups of water to cool the tea down to room temperature. Place tea, SCOBY and leftover kombucha in a glass jar or measuring cup. Cover with a tea towel and use a rubber band to keep it in place. 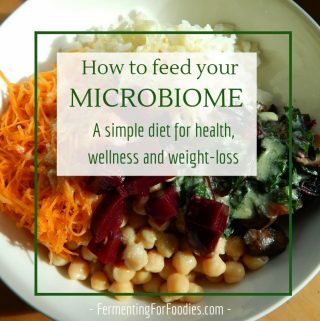 Allow it to ferment in a warm location for 3-10 days (depending on room temperature). Pour off a little liquid to taste it. It is finished when it has reached the desired level of sourness (it starts really sweet and becomes sour). Pour it off into a plastic bottle or a swing top beer bottle leaving the SCOBY and ½ cup of leftover kombucha behind for next batch. 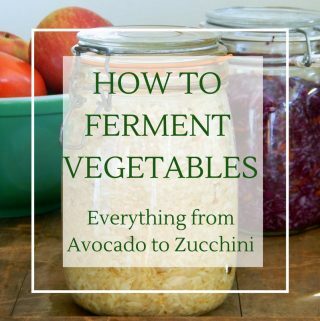 Allow to ferment for a further 1-5 days so that it can become really carbonated. Refrigerate to stop the fermentation. -I’ve written a post on Flavouring Kombucha so you can learn how to make your kombucha taste like cream soda, sparkling lemonade or whatever your heart desires. 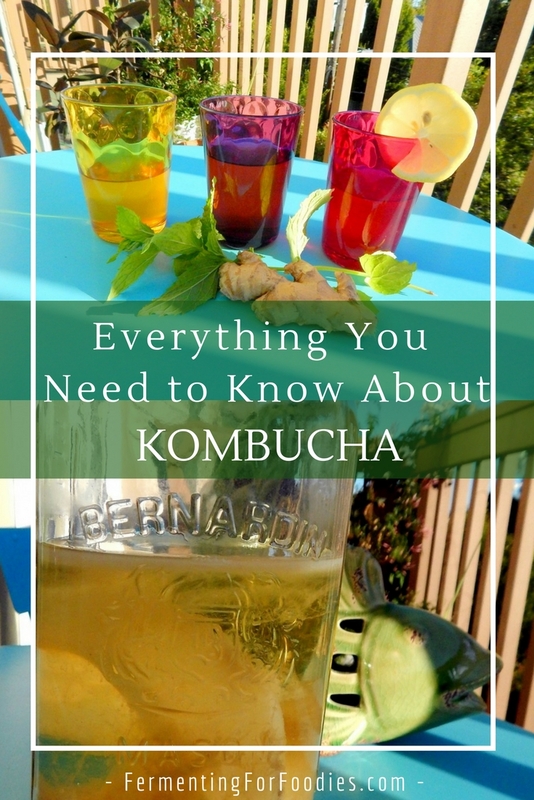 -It is possible to brew Kombucha with honey or herbal tea. -A new SCOBY might grow across the top of your bottled kombucha. Simply pull it out and throw it away before drinking. It probably won’t be healthy enough to brew a new batch of kombucha. -If you want to use up your leftover SCOBYs try making SCOBY jerky! I didn’t know a SCOBY could last up to three weeks in the fridge! That’s great to know! Thank you for sharing all of your tips on kombucha, I think i’m ready to give it a go myself and stop buying from the store! I have read that the cold temp of a fridge will kill a scone and that it needs to be kept in a ‘Scoby hotel’ a jar with something to feed off?? The cold temp will slow it down, but you should definitely still store it in sweet tea. A scoby hotel is great too, but you may find that you quickly end up with a lot of scobys! If you want to take a long break, find a friend to care for your scoby, then you can get a new scoby from them when you’re ready to start brewing again. Hi, I have large SCOBYs (.?) from my apple cider vinegar. I’m thinking of using this to brew some kombucha. What do you think? The apple cider SCOBY isn’t exactly the same as a Kombucha SCOBY… however, that doesn’t mean it won’t work. Give it a go! It may take a few batches to get a healthy SCOBY, but it could naturally make the transition. 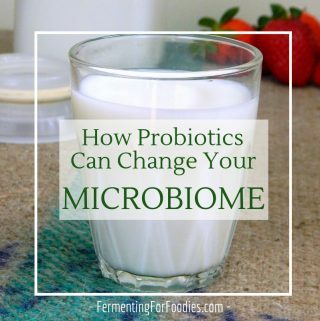 Either way, it will probably ferment the sugars… so you’ll have some sort of probiotic beverage. Let me know what happens! Just wondering if you can use store bought ready made flavoured ice teas to make kombucha. I wouldn’t use them for the first ferment as they probably have preservatives. Unfortunately preservatives aren’t required to be labeled on the ingredient list (because they are only in small quantities) however, they will prevent the kombucha from fermenting properly. However, it’s fine for the second ferment (flavouring).